Mr. Rahul Pandit is the Chief Mentor and Managing Director of ActIT Technologies & Educational Services Pvt. Ltd. An Engineering Graduate from University of Mumbai with Certifications from Microsoft and Indian Institute of Technology (IIT) Mumbai, Rahul brings over 12 years of technology experience to ActIT and is today chiefly responsible for the Vision, Strategy, and Training Offerings of ActIT. Apart from ActIT, Rahul is also Founder & Director of Ideogram Technology Solutions [P] Ltd, one of the leading Web and Software Development Companies in India thats having more than 1000 Clients across Globe. 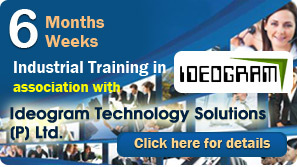 He has been mentoring IT professionals from past 12 years. He is recognized as "The Guru of Microsoft Technologies". His students have been placed in Fortune 500 companies including Microsoft, Google,TCS, IBM, Infosys and Tech Mahindra. He has been instrumental in shaping the goals and values at ActIT. He is an inspiring personality. His strong penchant for excellence at professional as well as personal front, backed by a sincere and an honest approach towards life are the principle reasons for the success of the ventures he has participated in. The quality which easily percolates among his students is dedication towards the profession. Rahul has prowess in wide variety of Technologies that include Entire Microsoft.net Platform, PHP, ASP.net. Rahul is Expert on Web Development Front having developed more than 250+ Websites single handedly, he has expertise on HTML, DHTML,CSS, JAVA Scripot, JQuery among others. Rahul has experience of managing and configuring Web and Database Servers of very high magnitude. One of the first persons in South East Asia to get trained on Microsoft.net. Winner of inter College Web Design Contest among 150 Participants of different Engineering Colleges all over India. Architected a one of the Best Content Management System that is currently being used by numerous News Papers and News Agencies. Architected and Developed J&K’ s first Travel Portal “www.flywithkrrsih.com” which has the feature of Online Air Ticketing of any Airlines. The system also incorporated Payment Gateway with the entire system having capability of issuing 10,000+ Tickets per Hour. Developed more than 250 Websites single handedly. Developed website on Sixth Pay Commission website in record time of 4 hours. Consultant for various organization on IT. Consultancy provider on Subject of VAS, Bulk SMS and Short Code(Two way SMS Services) to various organizations.